Only a few Brasher Doubloons exist today and you may need more than $5 million just to add one of them to your collection. Minted around 1787, it is still unclear why they were made in the first place. 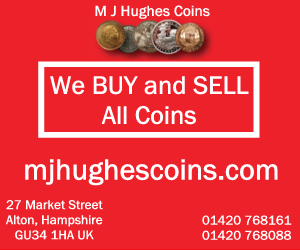 In the 1780’s, U.S. coinage was at it’s beginning. The U.S. Mint at Philadelphia was still 5 years from being open and much of the circulating coinage were foreign or colonial tokens. Ephraim Brasher was born in 1744 in New York, NY. He was a Goldsmith, Silversmith and Jeweller. He also lived next door to his good friend: George Washington. States were legally entitled to mint their own coins and in 1787 Brasher petitioned to allow him to have a franchise to mint copper coins for the New York State. The request was turned down as New York didn’t want copper coins. Brasher was already used by New York as an assayer to proofing of the foreign gold coins in circulation at the time by clipping or plugging as necessary. Brasher marked the assayed coins with an “EB” counterstamp as a hallmark. Brasher also wanted to design and make his own coins for circulation. 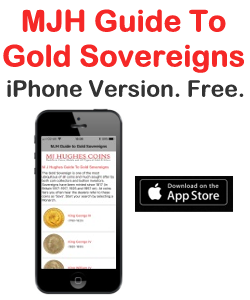 He decided that it it would be a gold coin based on the Spanish doubloon, weighing 408 grains giving it a value at the time of about $15. 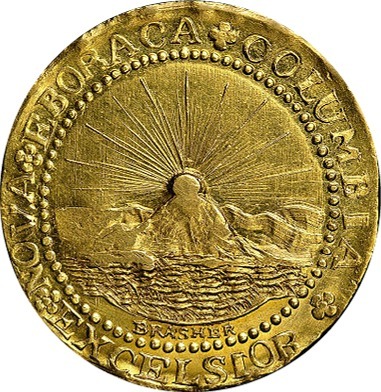 His first effort was the Lima style doubloons which he made in 1786 although he dated the coin 1742. 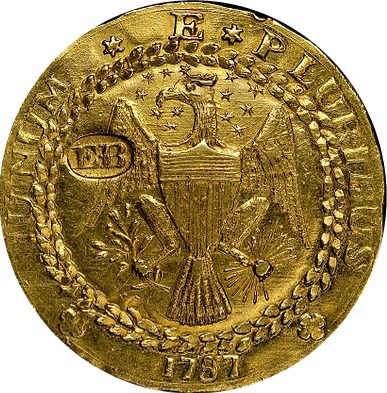 The first 1787 doubloon depicted an Eagle on one side and the coat of arms of New York on the other. The one above shows the Sun rising over a mountain with the sea in the foreground. Besides stamping his “EB” hallmark on the coin, Brasher wrote his name on it too. He made (just one) half-doubloon, which is now in the Smithsonian museum. No-one quite knows for sure why Ephraim Brasher made these coins; maybe they were intended as patterns but they never reached production and the entire series is just 7 doubloons. Given that count and the history behind them, the Brasher Doubloon has become one of the most important, most famous and most sought-after coins on the planet. The 1787 Doubloon with “EB” on the wing was sold by auction in 2014 for $4,582,500. 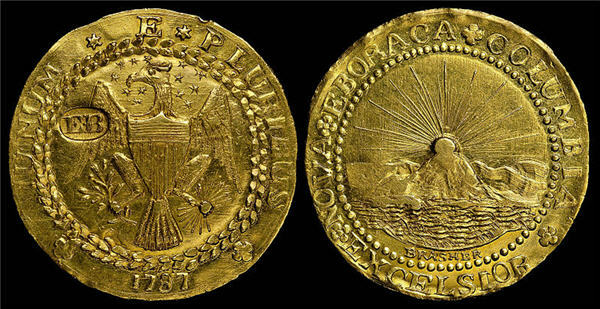 The 1787 Doubloon with “EB” on the breast would no doubt command the same price. Lima-styles (2 known) probably carry a $700,000 price tag. Even the assayed foreign coins hallmarked with “EB” go for $5,000+. The coin is so famous that in 1947 there was a film/book “The Brasher Doubloon” based on it where Raymond Chandler’s private eye Philip Marlowe ties a stolen gold coin to blackmail and murder. 1997 USA Eagle 1/10oz Gold Coin. Who are the Presidents on the most popular USA Coins?